What Is Your Dog Really Thinking About? You may look at your dog(s) sometimes, and think: ‘I wonder what is going on in their mind’. If only we could have some futuristic device, which allowed us to look into the thoughts of our four-legged friends, and see what they were really thinking. Alas, although we all hoped that such a device would exist in 2018, it doesn’t, so we’re just going to have to make an (educated) guess. We’ve put together a list of what we think is going on in your dog’s brain. Don’t hold us to it, though. This is a no-brainer if you’re a dog owner, and you see how your dog reacts when you come home from work. Your dog is pretty much obsessed with you, and research shows that when dogs think about their owners, it activates the reward centre in their brains. So when they think about you, they get a little brain buzz, and just want to hang out with you. Come on, that's the best thing ever. Tell us we’re wrong. Another obvious point for anyone who lives with a dog, but they’re obsessed with food. They think about it all of the time, and we think that this roughly translates to: your dog just thinks about how he can break into the fridge. One day, he's going to crack it, you know? We’re not saying that your dog is a spy. He just thinks about food all the time, probably even more than he thinks about you. And that’s a lot. 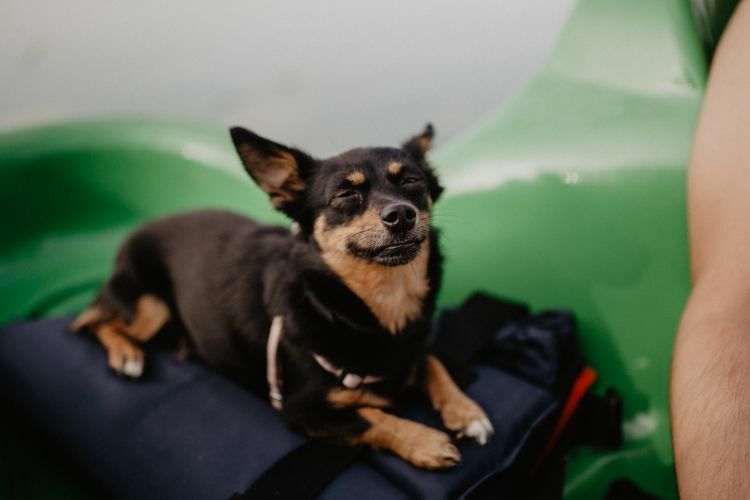 Your dog is probably daydreaming about running in the park, meeting other dogs, sniffing questionable materials discarded by other dogs, and jumping in muddy puddles so he can ruin your nice clean carpets. Ok, he doesn’t mean to ruin your carpets. But your dog loves walking, probably even more than you do. We all know how excited our pooches get at anything that sounds like the word 'walk' or the jingle of their lead. He deserves the best dog collars and leads in town, because walking is on his brain all of the time. After food, and you, of course. It has been proven that dogs do have emotions, and they can sense emotional changes in the voices of their owners. They also worry about us, research has shown, but we like to think that they don’t just sit there hoping that you get to work on time, and worrying that you may get sacked if not. They understand when they’ve done something wrong, and when you’re upset, and a whole host of emotional things. So they may be, you know, just thinking about life. So, there it is, a short guide to the inner workings of your dog’s brain. In this order, they probably think about: food, what you’re up to, and playing outside. The truth is, they may be thinking about a variety of things, but they probably aren’t pondering who won the space race. Although the answer to that question is, invariably, dogs.